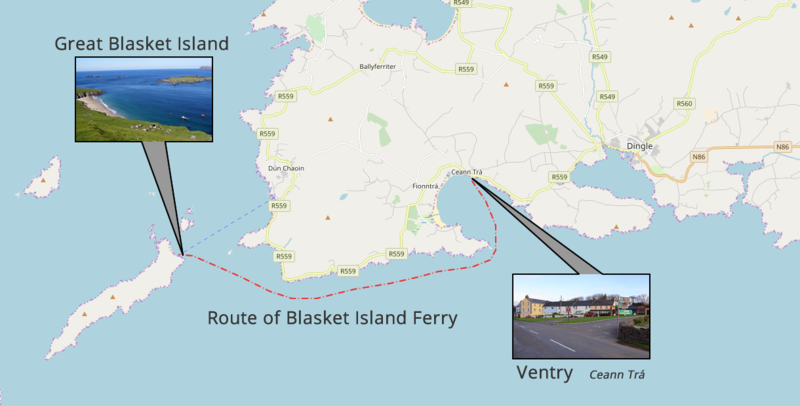 Ventry pier is 4 miles - 6 km west of Dingle town, Co Kerry, Ireland S.W. We take time to actively look for and spot (common) dolphins; (Minke) whales; basking shark ( April / May); seals and sea birds along the way, and stop for a while if / when we encounter marine wildlife in Dingle Bay and the Blaskets. Holding tank on board for on shore sewerage disposal. Absolutely no rubbish overboard (or customers go with it!). We pay all our team a living wage. We are a community based, local, community-aware and resourced company and we are socially and environmentally responsible.